Grabel was accompanied at the reception by Joyce Jacobsen, provost and senior vice president for academic affairs; Joe Knee, dean of the Natural Sciences and Mathematics Divison, Beach Professor of Chemistry; Jan Naegele, Alan M. Dachs Professor of Science and professor, neuroscience and behavior; and Ishita Mukerji, Fisk Professor of Natural Science, professor of molecular biology and biochemistry, director and professor, College of Integrative Sciences. 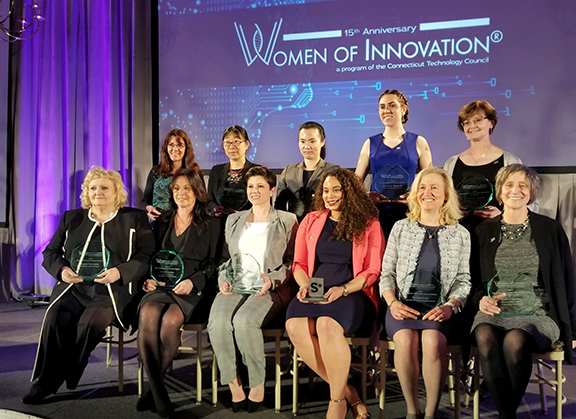 The awards dinner kicked off the 2019 Women of Innovation® program for the Connecticut Technology Council, a statewide trade association focused on technology and technology-oriented companies and institutions, providing leadership, guidance, and support in areas of policy advocacy, community-building, and assistance for growing companies. Grabel was named one of 50 finalists for the award in early March.